Here’s what’s up in the world of TV for Tuesday, January 26. All times are Eastern. Outsiders (WGN, 9 p.m.): If the last several years of Elmore Leonard-based television has taught us anything, it’s that rural Kentucky is a terrifying, anarchic place, the kind of place only a fool would dare venture into. 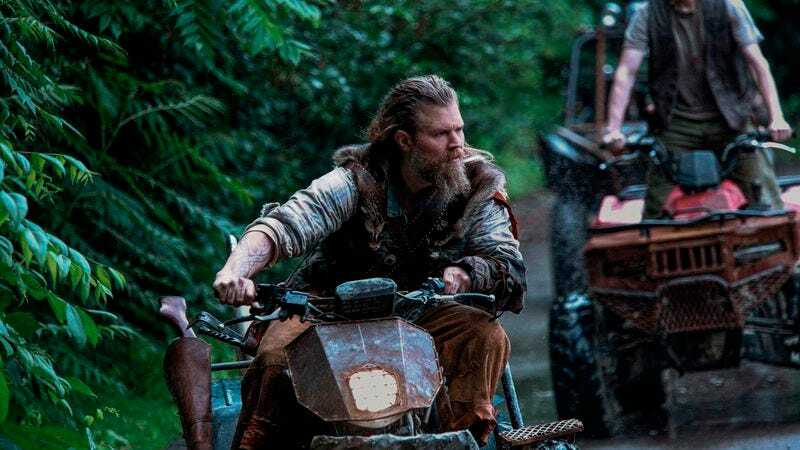 Well, WGN’s latest takes that idea and runs with it in a big way, presenting an entire clan of isolated, ATV-riding outlaws in Appalachia and their ruthless efforts to preserve their off-the-grid existence. As Dennis Perkins explains in his pre-air review, it’s all a little ridiculous, yet the excellent’s cast’s performances make the whole thing feel far more real and compelling than you might expect. The Flash (The CW, 8 p.m.): Last week’s episode teased the apparent return of the non-Harrison-Wells-looking version of Eobard Thawne, the Reverse Flash. Which may or may not be impossible, given how last season ended with erasing Thawne’s entire ancestry from existence, but then maybe that just makes him a temporal free agent, unbound by our petty rules of time or cause and effect. He’s more powerful than ever! Scott Von Doviak wonders whether Thawne’s return is finally going to get Team Flash to recognize that it wasn’t actually Harrison Wells who murdered Barry’s mom, because it feels like there’s still confusion on that point. Brooklyn Nine-Nine (Fox, 9 p.m.): Craig Robinson returns for the latest chapter in the Pontiac Bandit saga, as Jake and Amy encounter Doug Judy on their big cruise vacation that Jake really, definitely can’t afford. Also, Rosa is busy fighting with Charles for the same apartment, meaning she won’t be around for Doug to declare his undying love for her. LaToya Ferguson will just try to cope as best she can. Marvel’s Agent Carter (ABC, 9 p.m.): Howard Stark shows up for the first time this season as Peggy continues to investigate Zero Matter. While we’re happy with Agent Carter’s work in the late 1940s, we kind of hope the show eventually goes on a massive flash-forward, just so that we can see the show desperately attempt to pull off turning young Howard Stark actor Dominic Cooper into old Howard Stark actor John Slattery. Oliver Sava bets it would make Looper’s Joseph Gordon-Levitt/Bruce Willis transition look downright graceful by comparison. Hey, look, we didn’t forget about The Expanse! The Rocinante crew come across a derelict vessel that holds a potentially devastating secret; a horrifying discovery is made after Holden finally crosses paths with Miller in Eros; and Avasarala receives some crushing news back on Earth. And that’s what’s happening on The Expanse tonight. Zack Handlen just sits in awe of our journalistic acumen. A quintet of TV Club writers offers 5 To Watch for Happy Endings, which makes us miss Happy Endings all over again. We could use this space to praise any of the main cast of that show, but we’re just going to go ahead and randomly pick … Dave. On any other show, Dave would just be the worst, and, yeah, he kind of was in the early going there, but goodness did Zachary Knighton find the hilarity of that role, from his intervention-worthy obsession with V-necks and his utterly self-serious trumpeting of his supposed Native American heritage. Also, he’s just so scruffily dreamy! Panda Republic (Animal, 8 p.m.): If you’ve got any hot takes stored up about the pointlessness of saving pandas, given their legendary (and largely overhyped) disinterest in mating, then now’s as good a time as any, as this new show looks at a pair of remote Chinese facilities trying to breed these bears (and yes, they’re bears) in capitivity. Huh, our blurb for Panda Republic was way saucier than we expected it to be. Finding Your Roots With Henry Louis Gates Jr. (PBS, 8 p.m.): Expect lots of geneaological joshing—Randomest alliteration ever? Randomest alliteration ever—tonight, as Bill Hader, Jimmy Kimmel, and television legend Norman Lear bring the funny to family history research. The Mine Wars: American Experience (PBS, 9 p.m.): This two-hour documentary looks at efforts to unionize West Virginia coal miners in the early 20th century. Of particular interest is the examination of the labor uprising known as the Battle of Blair Mountain, which—and we only just learned this, but now want to know everything about it—is considered “the largest armed insurrection since the Civil War.” This ought to be good. Ice Cold Killers (ID, 9 p.m.): “The disappearance of a single mom during an icy Wisconsin winter is investigated.” Poor Wisconsin. Neighboring Minnesota has all its crimes depicted in the acclaimed, ever-expanding Fargo universe, while the Badger State gets one random episode of one of ID’s endless parade of true-crime shows. Wild Expectations (Animal, 10 p.m.): And this show kicks off with a pair of explorers taking in all the wonders of Chile. We’re going to go ahead and bet the cinematography is just sumptuous. What Would You Do? (ABC, 10 p.m.): Apparently this is a decently long-running show in which newsman John Quiñones uses hidden cameras to put people in tricky ethical dilemmas, then sees what they do. But really, we at What’s On Tonight recognize only one What Would You Do?, and it’s the one with Marc Summers and the damn Pie Coaster. Live Free Or Die Hard (AMC, 8 p.m.): Since The Outsiders marks television’s return to the lawless hills of Kentucky, let’s take a moment and once again tip our cowboy hat to the show that damn near perfected telling stories in that setting. This movie has Timothy Olyphant as the villain, so it feels as good a place as any. We miss you, Justified. American Graffiti (Flix, 8 p.m.): Now that George Lucas has sold off the Star Wars franchise and is apparently done calling its current rights holders “white slavers,” maybe he’s got time to make the tardy American Graffiti sequel we’re all desperate for? (And no, we don’t recognize More American Graffiti. Bill L. Norton is a hack!) If bringing back Harrison Ford’s Bob Falfa after a lengthy absence from our screens is half as good as bringing back Han Solo (and, oh, let’s say 100 times as good as bringing back Indiana Jones that last time), then we’ve got a hit on our hands! The Brady Bunch Movie/A Very Brady Sequel (Encore, 8 p.m./9:30 p.m.): If you’re looking for pretty much the earliest evidence of the comedic genius of Gary Cole—and for some reason consider neither Midnight Caller nor American Gothic laugh riots—then look no further. Australian Open: Women’s and Men’s Quarterfinals (ESPN2, 9 p.m.): The highlight looks to be the match between Andy Murray and David Ferrer. Murray has been the runner-up at the Australian Open in four of the last six tournaments, and he’s a decent bet to end up exactly the same against whoever emerges from the likely Djokovic-Federer semifinal on the other side. And we say this as a Murray supporter.